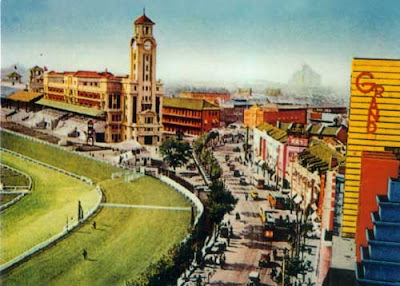 The China Beat: Reclaiming Old Shanghai? “Shanghai flames with millions of flashing jewels at midnight. The centre of night life is a vast crucible of electric flame. “The throb of the jungle tom-tom; the symphony of lust; the music of a hundred orchestras; the shuffling of feet; the swaying of bodies; the rhythm of abandon; the hot smoke of desire, desire under the floodlights; it’s all fun; it’s life. 5. Check out the Tales of Old Shanghai index for more images of Shanghai (like the image above).